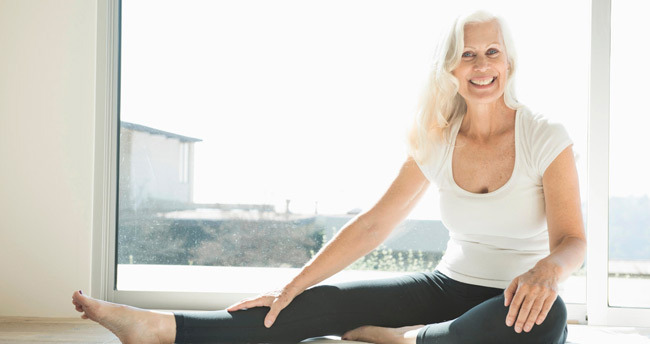 Stretching tends to be the most overlooked and neglected among seniors, yet nothing is more vital to keeping an aging body limber and injury free. Here’s what you should know along with some tip and resources to help you regain some flexibility. According to a study reported in 2013-14, to determine differences in physical activity level and functional fitness between young elderly (60-69 years) and old elderly (70-80 years) people with the hypothesis that an age-related decline would be found. Aging has a huge role to play in activity decline process. These differences between young and old elderly people were found to be due to the reduction of muscle strength in both upper and lower limbs and changes in body-fat percentage, flexibility, agility, and endurance. If elderly individuals do not take part in physically active lifestyles, they expose themselves to the risk of their muscle mass and joint motion reducing by 40% and 10%-40%, depending on body part, respectively, while loss of muscle strength (~30%) is related to a decrease in muscle mass. 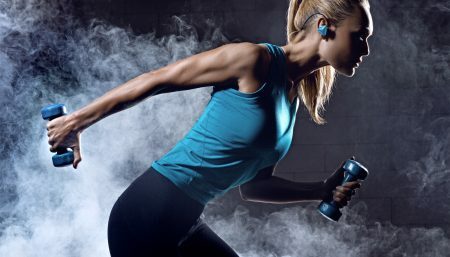 Muscle mass and strength tend to reduce by 30%-50% between the ages of 30 and 80 years, with the main cause the reduction in the number of muscle fibers and atrophy of type II muscle fiber. Furthermore, losses in muscular strength occur at an approximate rate of 12%-14% per decade after age 50 years. However, resistance training is generally thought to be a promising intervention for reversing the loss of muscle function and deterioration of muscle structure associated with the aging process. Muscular function is not the only deterioration associated with the aging process if PA is not maintained. Significant decrease in aerobic capacity have been found after the age of 40 years, such that at the age of 65 years it has approximately 30% less capacity. This means that the capacity for elderly people to undertake aerobic activities such as walking and running is adversely affected by advancing age, due to the decline in maximal oxygen uptake of about 0.5%-1.0% per year. Studies have also shown that the number of falls increases by 35%-40% after 60 years of age,which is a consequence of reduced muscle strength, balance, and flexibility. Stretching exercises should focus on the muscles in your calves, front and back thighs, hips, lower and upper back, chest, shoulders and neck. If you’ve had hip or back surgery, you should talk to your doctor before doing lower-back flexibility exercises. Turn your chin to the right and toward your chest..
Place your right hand over the top of your head, and gently pull your head down toward the right. You will feel a stretch in your left trapezius, and if you touch the left side of your neck with your left hand, you will feel the tight muscle being stretched. Hold this stretch for 30 seconds, and then relax. Repeat this stretch four times, remembering to breathe. Switch chin direction to the left. Place your left hand over the top of your head, and gently pull down to stretch your right side. Raise your right arm up to shoulder height, and move it across the front of your body. With your left arm, pull the right arm as close to your chest as possible, and hold it for 30 seconds. You should feel the stretch across the back of your shoulder. Repeat this four times, then switch to the left side. With your feet shoulder width apart, raise your right arm straight up and over your head. Bend your elbow so that your right hand is reaching for your left shoulder. Use your left hand to press back on your right elbow. You will feel a great stretch in the back of your arm and upper shoulder. Hold for 30 seconds, and repeat four times on each side. Place your hands in front of you on an exercise ball or the seat of a chair. While keeping your back flat, reach forward with your arms, and lower your buttocks to your feet. You will feel a stretch along the sides of your back relax. Hold for 30 seconds, while breathing, then relax. Repeat four times. Next, place your hands shoulder width apart on the ground. It will look as if you are crawling. Start by standing with feet together. Step forward onto the right leg while keeping your knee aligned above your ankle and your hips forward. Raise both of your hands above your head as you lean forward. You should feel a gentle stretch in the front of your back leg. Then, lean toward the right leg, and raise your left arm over your head. The stretch will move to include your left side as well as the front of your back leg. Finally, raise your left arm above your body, and twist it to behind your body. This opens up the left side of your body. Hold each position for 30 seconds, and then switch legs and repeat all three positions four times. Lie down with the small of your back against the floor. Bend your left knee to 90 degrees to stabilize your hips. Slowly raise your right leg off the ground with the knee as straight as possible. Your right hip should not rise off the floor, and the motion should come only from your hip. As your foot approaches vertical, you will feel a stretch in the back of your leg. Hold your leg in this raised position for 30 seconds. After 30 seconds, relax your knee, and then repeat three times before switching to the left leg. Stand with feet together and hips straight. Bend your right knee back, and take the front of your right foot in your right hand. Keeping your knees even (i.e., do not let your right knee swing forward), bend your right knee back. You will feel a stretch in the front of your leg from above your hip to your knee. Do not allow your posture to curve forward, but keep standing straight up. Hold the stretch for 30 seconds, and then relax. Repeat this four times, and then switch to the left quad. Stand with your feet shoulder length apart and your hands against a chair or a wall. Keep your heels on the floor and your knees straight while leaning into the chair or wall. You will feel this stretch down the back of your legs. Hold for 30 seconds. Then bend your knees, and continue leaning in. Hold with bent knees for 30 seconds, then repeat with straight and bent knees four times. Stretch every day for 15 minutes. You can break the stretching regimen up over the course of the day and do one body part at a time. Maximum benefit is achieved with a slow muscle stretch until the muscle feels tight but doesn’t hurt. Hold the stretch for 30 seconds without bouncing. After 30 seconds, rest for 10 seconds, and then repeat the stretch for a maximum of four repetitions. 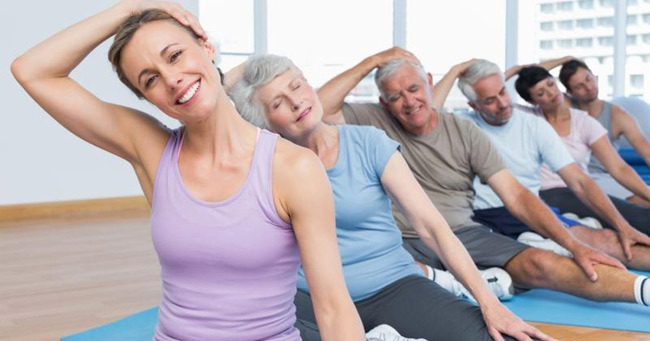 If you are older than 65, you need to hold the stretch for 60 seconds. It takes about six weeks of consistent stretching to see good results, and then you must maintain your muscle length by continuing daily stretches.